Totupola Kanda (2,360m), Sri Lanka’s third highest peak, seen from the Maha Eliya bungalow. We hiked up to the summit on Day 2 of the WWW trip. 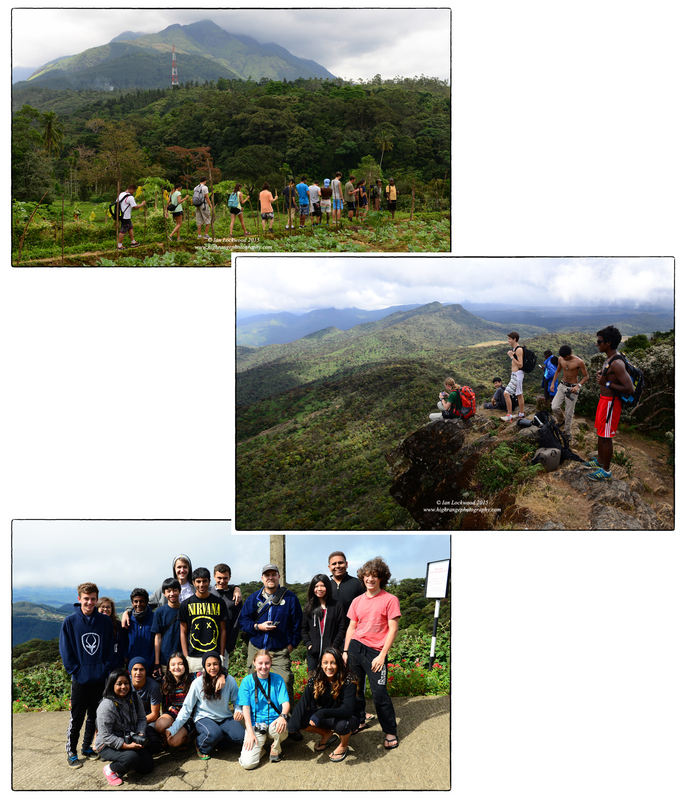 In the last few months I have had the opportunity to lead groups of OSC students into Sri Lanka’s Central Highlands for two different learning experiences. In December we did the annual field study in Sri Pada based out of the Fishing Hut in Maskeliya plantation’s Moray Estate. As usual, my class and I focused on studying themes of vertical zonation, biodiversity, land use and forest types. We were a small group made up of seven students, one parent and OSC’s Grade 3 teacher, Erika Williams, who accompanied us as a female chaperone. At the end of January I was back in the hills again, this time with my Week Without Walls microtrip. In this second year, we focused the learning though an MYP-inspired Interdisciplinary Unit (IDU). The focus was to learn about the ecology of the highlands through photo documentation with daily hikes being a key aspect. Over five packed days we looped though the hills starting in the south at Belihuloya and ending up on Sri Lanka’s highest peak Pidurutalagala before returning to Colombo. Learning about the landscapes, both natural and human influenced, was a key part of the WWW learning experience. We started on a hike out of Belihuloya navigating rice paddies and intermediate zone semi-evergreen forest. Later we walked through pine plantations, swam in cold mountain pools, climbed the three highest mountains in Sri Lanka and spent several nights in the high altitude Horton Plains. The weather was dry and in the plains we awoke to frost before we did a brisk hike on the World’s End trail. The group exerted themselves every day- helping to address the Action or Activity IB CAS requirement. There were gastronomical joys –in simple camp food and more lavish spreads on the last day. The 15 students developed a newfound appreciation for hot water, electricity and cell phone connectivity. They did amazingly well and, despite a few stumbles into serious mud, came through in good spirits. 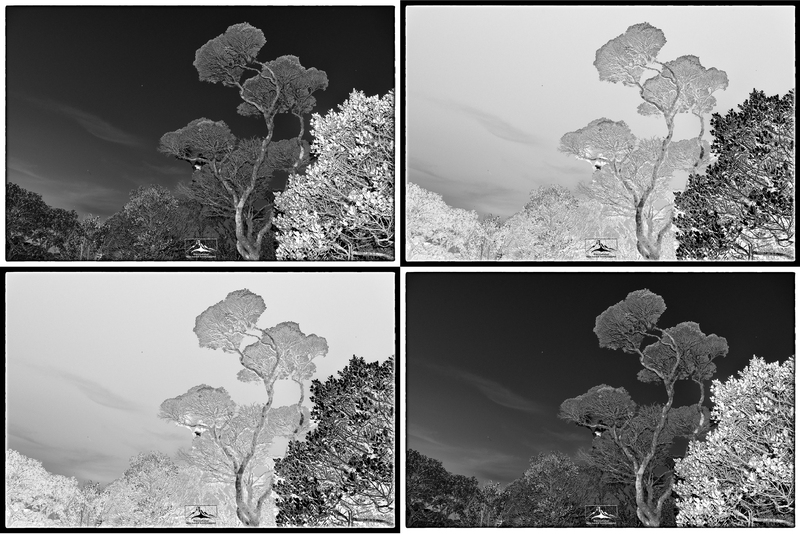 In this post I share some of the different landscapes in panoramic format. 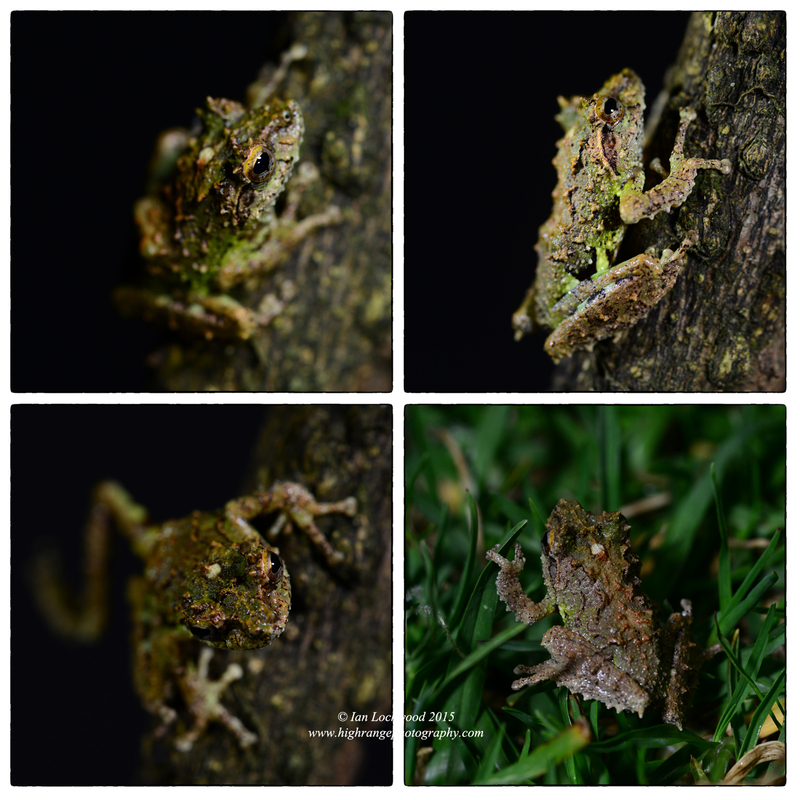 Part II highlights the biodiversity that we encountered. OSC students approaching the summit of Kirigalpotta (2,388 m) Sri Lanka’s 2nd highest peak on Day 3. There is a bit of drop to the north of the peak that, when wet ,can look like from milk from a distance-hence the name of the peak. We had clear, albeit hazy, views back to Totupola Kanda (left peak) and World’s End (under the clouds to the right). Virtually the whole trail to the peak and back is visible behind the group. Healthy evergreen forest on the southern slopes of Horton Plains seen above Bambarakanda Falls. On the right, the land had previously been cleared for either tea or pine plantations. Grasses have now taken over the area and some patches show signs of recent burning. The altitude here is approximately 600 meters. Calophyllum walkeri sentinels in a patch of dieback cloud forest near the Ohiya entrance to Horton Plains National Park. Looking across Ambawella farms and Hakgala to Pidurutalagala (Sri Lanka’s highest peak) from the slopes of Totupola Kanda at the end of a quick hike on Day 2 of the WWW experience. This was the first time that an OSC WWW group hiked up to Totupola (the third highest peak). It is an easy gradual trail through “pygmy forest”-literally waste-level, wind-blown cloud forest covered in mosses and epiphytes. There was also a surprisingly high number of leopard scats on the path. Shades of Eravikulam and the high Western Ghats? 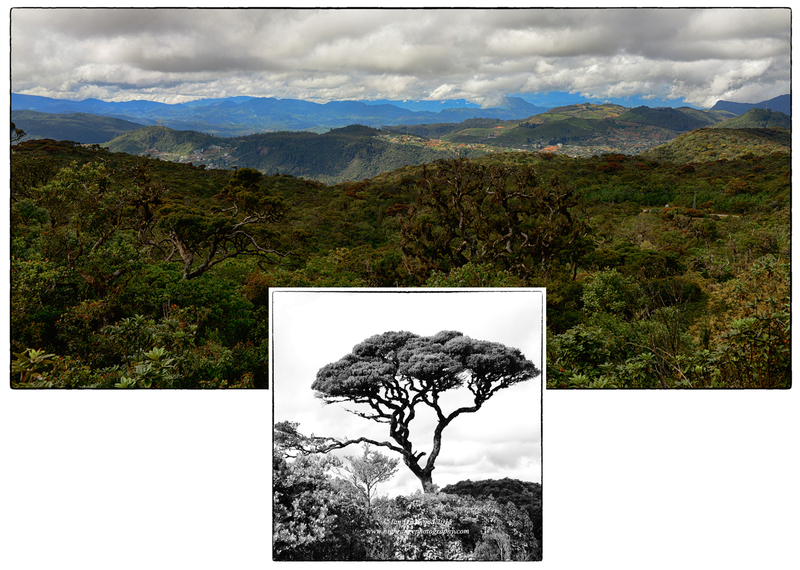 Actually, the landscapes of Horton Plains are both similar and yet very different than their cousins across the Palk Straits. Here, south of the World’s End trail, patanas (grasslands) and cloud forest highlight the unique aspects of Sri Lanka’s high altitude landscapes. The cloud forest dominates ridge tops while the patanas fill the valleys. This is opposite to what is found in the shola/grassland mosaic vegetation of the high altitude Western Ghats ranges. Similar to the Nilgiri Hills, the patanas have healthy populations of fire and frost-resistant Rhododendron arboreum trees. View 1: Cloud forest and frosty valleys of patanas in Horton Plains National Park. View 2: Cloud forest and frosty valleys of patanas in Horton Plains National Park. Kirigalpotta (2,388 m) Sri Lanka’s 2nd highest peak is undistinguished high point in the center-right of the image. It has a more prominent, pyramid profile when seen from the west. Tree ferns (Cyathea crinita) seen from the road to Pidurutalagala with Sri Pada – out of focus – in the back ground. Sri Pada seen from the summit of Pidurutalagala Sri Lanka’s highest point at 2,524 m. We experienced a spectacularly clear day with crisp views looking at the Central Highlands to the south of the peak. Most of the foreground was once cloud forest and has now been converted to vegetable gardens, timber plantations and tea estates. Looking down at Nuwara Eliya’s Gregory Lake (altitude @ 1,868 meters) seen from Pidurutalagala, Sri Lanka’s highest point (2,524 m). The area in and around Sri Lanka’s premier hill station is well known for its tea, tourism and productive vegetable plots. View south from the lower slopes of Pidurutalagala. The panorama is stitched together from nine different images and greatly reduced in size in order to upload it here. Key mountains are labeled on the image. The 2016 Sri Lanka Highlands WWW route map. Click on the link below for it to open in ArGIS online. Early morning mist burning off above cloud forest at Little World’s End. 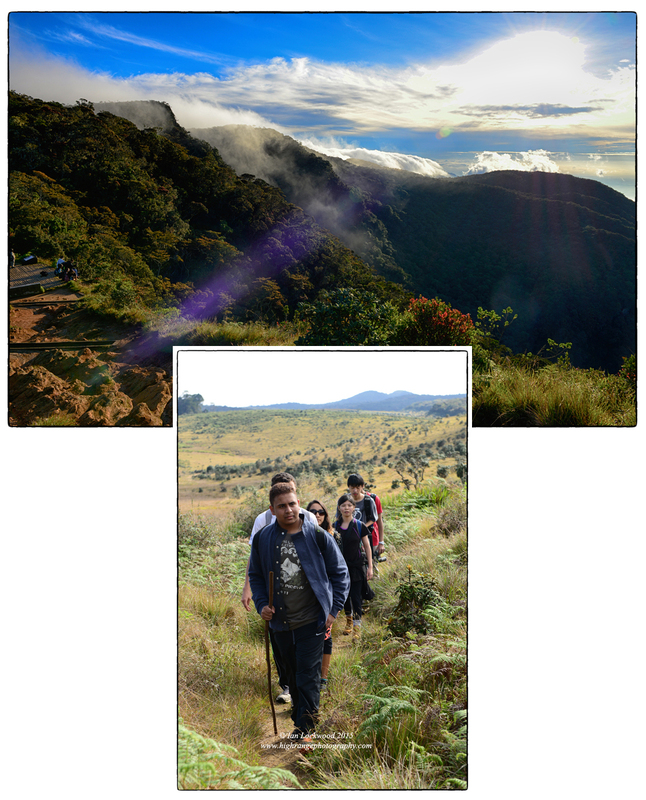 (Lower image) Trail to Kirigalpota passing through expansive patanas (grasslands). In 2010 Sri Lanka’s Central Highlands, the rugged assemblage of hills and mountains in the middle of the island, were recognized as a UNESCO designated World Heritage site. This came a full two years before the neighboring, sister range in India’s Western Ghats received a similar designation (UNESCO). Both areas are blessed with high levels of biodiversity and are under pressure from plantation agriculture, changing land use patterns, mining, large hydroelectric projects and other activities associated with human populations. Conservation International in its designation of biodiversity hotspots (based on the paper in Nature by Norman Myers et al) placed the two areas in its first list of 25 biodiversity hotspots in 2000. The similarities in vegetation, climatic zone, fauna, topography and other factors and makes sense for anyone familiar with the two areas. 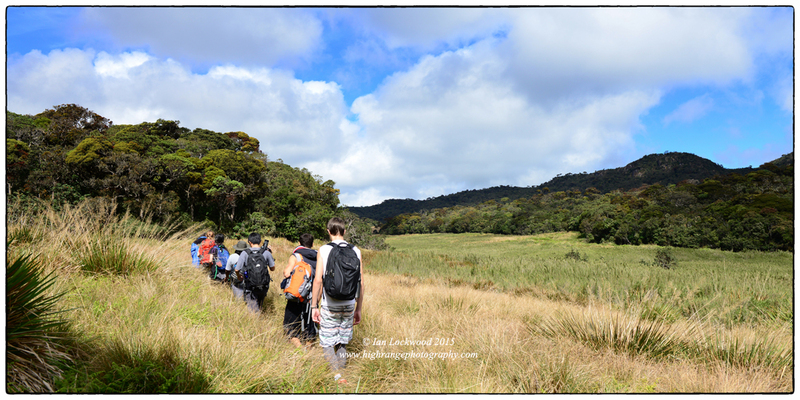 Looking to learn more about these themes a group of students and teachers from the Overseas School of Colombo recently explored deep and high into the Central Highlands. OSC’s Week Without Walls program is now in its seventh year of operation and it continues to develop as a model experiential education program here in Sri Lanka. It has been my privilege to be actively involved with the program and coordinate the different learning experiences. The planning is a continuous process, but it starts in earnest at the beginning of the school year. Soon after the winter break, when the second term starts, the entire secondary school fans out across the length and breadth of the island. The program is rooted in a belief that learning is often best achieved through experiencing what you are learning and not simply talking about it or getting lectured in it (see the David Kolb link below for more on this). OSC’s WWW learning experiences all have strong curricular links that are intended to incorporate active learning rather than be a passive sightseeing trip. In the Middle Year’s Program (MYP) that comes though individual classes (science, humanities, etc.) while in the DP it is channeled through the Creativity Action and Service program. The WWW program also has a key goal of helping OSC’s students and teachers get to know our host nation of Sri Lanka better. This aspect of learning was inspired by place-based pedagogies developed by the Orion Society. I was exposed to these ideas while participating in Lesley University’s ETL (MSc) program. International schools in our part of the world are good at organizing field trips outside of their host countries-often at considerable expense. With OSC’s WWW program we have tried to do something quite different. We want to help students better understand and engage with issues at home. Sri Lanka is, of course, a wonderful place to be experimenting with this pedagogy and there is a diversity of locations and issues to engage with. The OSC WWW program focuses on issues of culture, geography, ecology and history. A few of the older groups grapple with deeper, more complex issues of post conflict reconciliation and rural poverty. We still have a long way to fully develop the ideals of this pedagogy but it has been a rewarding journey of learning thus far. Exploring the trail towards Lanka Ella falls. This is roughly 1,000 meters elevation and just south-east of the HPNP boundary. Approaching Kirigalpotta through a landscape very familiar to anyone who knows the upper Western Ghats. Note that the cloud forests occupy hill tops while valleys have the patanas (grasslands). This is a reverse of what is found in the shola/grassland mosaic of the upper Western Ghats. The Central Highlands learning experience was one of four options that the two upper classes (MYP 5 and DP1) could choose from. The other trips included a visit to the Jaffna peninsula with a service component at the SOS Village, the “coast to coast” cycling trip based out of Arugam Bay and an art/culture/history experience in the Cultural Triangle. I designed and facilitated the Highlands trip with the active support of Will Duncan (DP Physics and Science HOD) and our school’s doctor, Indrika Senaratna. In a sense it was a logical outgrowth from past WWW learning programs that I designed in Sinharaja (2013) and the Dry Zone (2014). Will and Indrika have similar interests in the ecology (and especially bird life) of Sri Lanka. We were a good team and the 15 students were engaged and enthusiastic bout the daily walks, dormitory accommodation, chilly conditions and general flow of things. Our five-day journey circumnavigated and delved into the highest ranges of the Central Highlands and exposed student to the unique ecology of the cloud forest/patana mosaic. Each day had one or more hikes with key hikes being taken to Kirigalpotta (Sri Lanka’s second highest peak at 2,390 m), World’s End and a surprise visit up Sri Lanka’s highest peak at Pidurutalagala (2,535 m). We started at Belihulhoya, which sits immediately below and to the south of Horton Plains. For this stage of the trip we were assisted by the Ecoteam Sri Lanka company. They have a camp at Kinchiguna and did a fine job with taking care of us. Our itinerary in Belihuloya included several walks and water fall explorations before we moved on the next day. Highlights included several important rare bird sightings including an Oriental Dwarf Kingfisher, two different Coppersmith Barbets and a Chesnut-backed Cuckoo (with spotting provided by Will’s sharp eyes). Three different Grizzled Giant Squirrels (Ratufa macroura) also gave us good sightings of what is a relatively rare mammal in the Western Ghats. 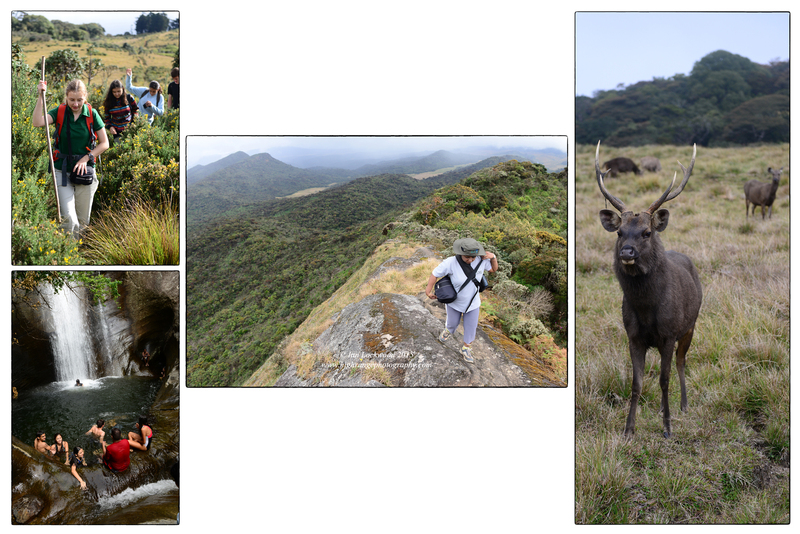 At the heart of the learning experience was a two-night, three-day stay at Horton Plains National Park. The park is an important protected area in Sri Lanka because it hosts a relatively large area of undisturbed cloud forest/patana (grasslands). Biodiversity is especially high here in these highest-most highlands of the island. In recent years it has also become exceedingly popular with tourists, such that it is the most visited national park in Sri Lanka (see Sarath Kotagama’s review of Rohan Petiyagoda’s outstanding book for more on this). You would think that staying in a basic dormitory with limited hot water, a few solar powered light bulbs and no cellphone connectivity would drive teenagers crazy. On the contrary, our group thrived and there were no complaints. We ate delicious, suitably spicy Sri Lankan food cooked up by the two caretakers for almost every meal in the park. 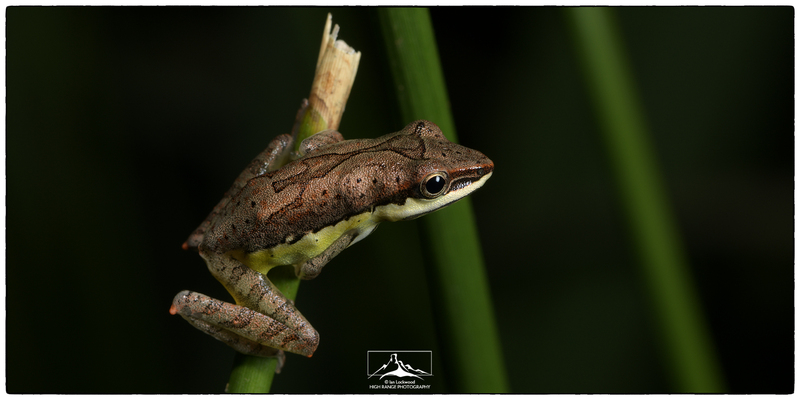 At night we looked (mostly in vain) for the stars and more successfully with a few small shrub frogs attracted to the lights of the building. The students kept field journals, with some producing fine sketches, water colors and written reflections. They also enjoyed being with each other but when it came to lights out at 9:30 there were few complaints and the group fell into a fatigued slumber soon after. In the park our primary task and highlight was to do a day hike up to Kirigalpotta, Sri Lanka’s 2nd highest peak. It is not a strenuous hike but is remarkable for the vegetation and views of the landscape that one encounters along the way. We were also fortunate to be the only group on the trail while just down the valley hundreds of tourists were doing the World’s End walk. There was a new maroon/red flush in the Calophyllum walkeri trees and the cloud forest canopy was dazzling. Will was able to get his Dull Blue Flycatcher and share the sighting with several of us. I had good sightings of Sri Lankan Wood Pigeons and a Black Eagle. We didn’t see any mammals on the trail in contrast to the road near Farr Inn where the sambar approach tourist vehicles (see image below). On the way back it rained heavily on the group. From the lowlands to the highlands: OSC’s WWW group on the move at Belihuloya (looking up to the highlands), take a breather on Kirigalpotta slopes and then posing on the summit of Pidurutalagala (photo courtesy of Will Duncan). New flush of Calophyllum walkeri on the Kirigalpotta trail flanking a scene from the the World’s End trail. OSC group on the Kirigalpotta trail & Lanka Ella Falls (lower left). Rusa unicolor being a little too friendly than one would like in a national park (there is a significant problem with people feeding them from their vehicles). Before leaving Horton Plains on Thursday we woke up early and took the group on the World’ End trail. With a name like “World’s End” it is understandable that visitors and Sri Lankans all want to see what it is all about. As a result, it is very well worn path that leads to several point along the escarpment of the Central Highlands. There are very steep slopes and cliffs with vegetation that fall abruptly into the southern plains near Belihuloya. I wanted to be at the trailhead by 6:00 am before the entrance gates opened and the busloads of tourists started arriving (we could do this because we were staying in the park). It was misty when we set out from the dormitory but the clouds soon burnt off and it felt like the beginning of time on the cloud forest shrouded trail. We reached the escarpment edge at Little World’s End just as the sun was coming up over the eastern edge of the Central Highlands. World’s End was equally stunning with clear views back to the rice paddies of Belihuloya and the large tanks on the plains. Our group slowed down to take pictures and take in the view, which is when the large numbers of tourists caught up to us. On the trail back to Farr Inn via Baker’s Falls I took in the scenery paying special attention to similarities and differences to the shola/grasslands systems that a few months ago I had walked though in Eravikulam. Little World’s End, looking south before the tourists arrive. 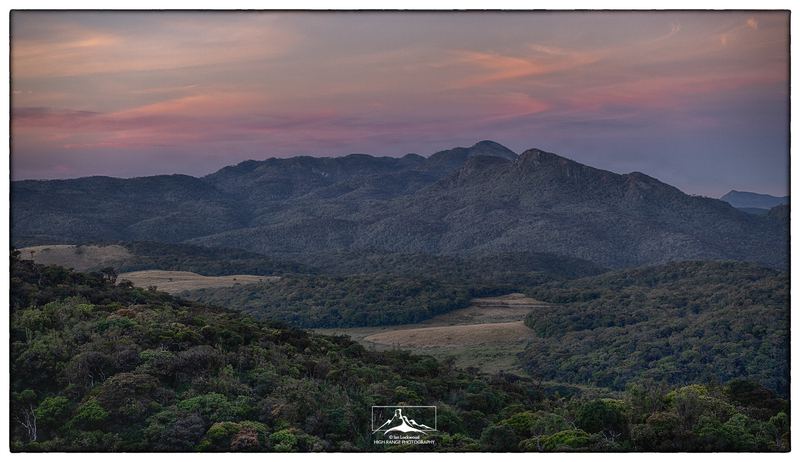 We had clear views down to Belihuloya where we had just been before moving up to Horton Plains. The Suiyakanda part of Sinharaja (Rakwana Hills) is on the horizon at the center of the image. 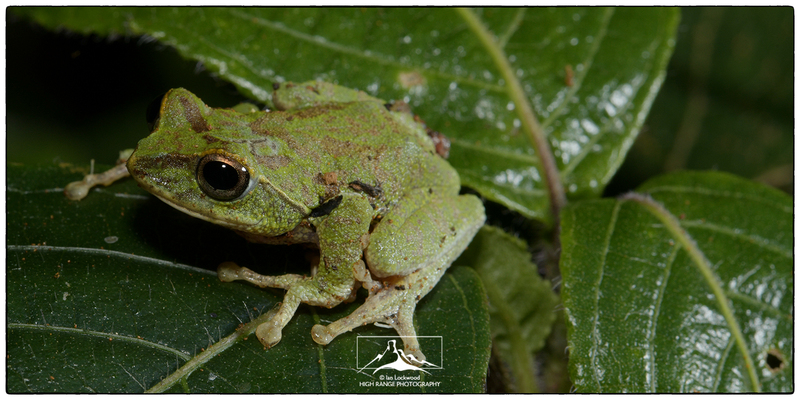 Study of an endemic shrub frog (Pseudophilautus schmarda) found in the Maha Eliya dormitory toilet. Endemic reptiles from the Central Highlands. 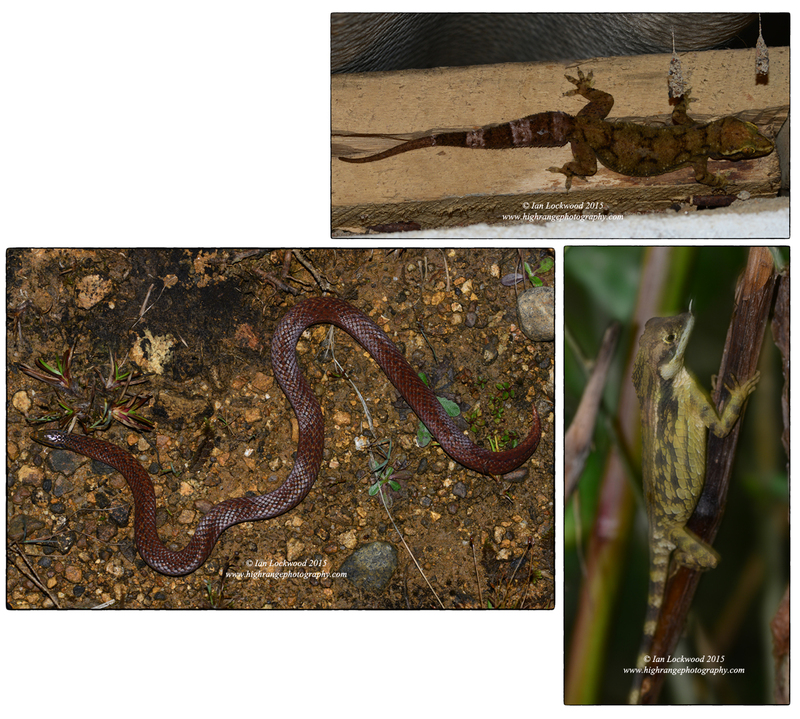 Clockwise from top: A bent-toe gecko from a toilet in Belihuloya (species awaiting confirmation). The Rhinoceros Horned Lizard (Ceratophora stoddartii) from cloud forest near Nuwara Eliya. Aspidura trachyprocta from the entrance of HPNP. Our last night was spent in the hill station of Nuwara Eliya located at the middle of the Central Highlands at 1,860 meters. Our stay was designed as a chance to allow students to clean up and eat well after three days of camp food. It also provided an opportunity to go looking for the very hard-to-find Pied Thrush (Ficedula subrubra) and Kashmiri Flycatcher (Zoothera wardii) in the town’s Victoria Park. That exercise proved to be a good opportunity for showing students to what lengths people will go to find hard to see birds! There were Yellow Eared Bulbuls, Forest Wagtails and Will saw a single Kashmir flycatcher but no one saw the thrush! The next morning while looking for the difficult to see SL Whistling Thrush (see my image of it from Sri Pada here) we had a good encounter with the endemic Rhinoceros Horned Lizard (Ceratophora stoddartii) in a cloud forest patch near the town dump. Cloud forest on Pidurutalagala: An appreciation. My highlight of the Nuwara Eliya part of the trip was taking an unplanned visit up to the summit of Pidurutalagala. This unassuming mountain marks the highest point (2,524 m) on the island. It hosts a large area of undisturbed cloud forests and has a commanding 360° view of the island. However, for the last 30 years it has been off limits as there is a military radar station on the summit. It has been my habit when in Nuwara Eliya to inquire about how to get up and I was pleasantly surprised to learn that it is now open to the public. You can’t walk it but after showing your ID you can drive up the steep, concrete road. It winds its way though a mature eucalyptus plantation and then exquisite cloud forest. Gnarled, stunted trees dripping with epiphytes and mosses crowd the road and signs warn you about leopards in the area. I would have loved to have stopped, especially when Sri Pada came into view, but we followed the guidelines not to and drove steadily along the 7 km road to the summit. At the top is a complex of buildings, antennas and different radar. After checking in, visitors are allowed to walk around it and take photographs looking away from the station. We had good views over Nuwara Eliya town but the more distant peak in Horton Plains and Peak Wilderness were under cloud cover. 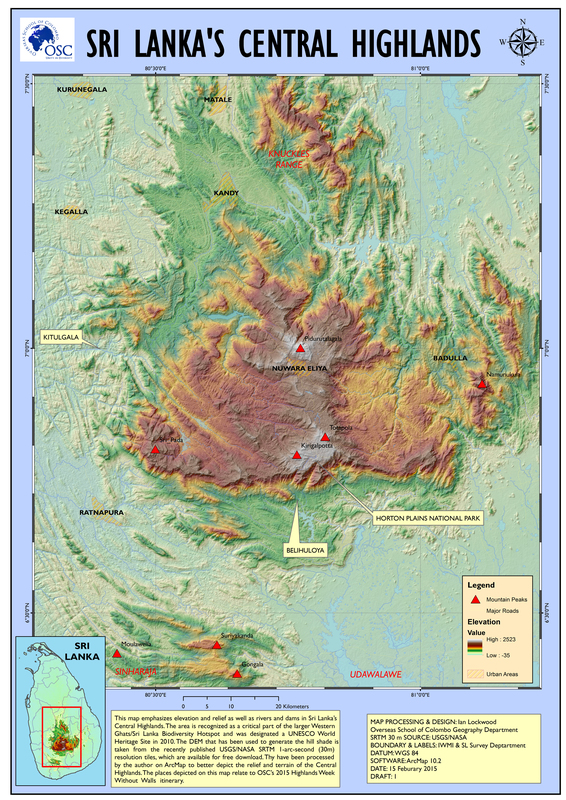 Elevation map of the Central Highlights emphasizing areas that the 2015 WWW Highlands WWW group visited. I utilized a mosaic of newly released 30m (1 arc second) USGS digital elevation models (DEM) to show relief and elevation. It marks an important personal cartographic milestone for me as it has taken several attempts to understand how best to use GIS data to make these representations of relief. As part of their learning experience all of our DP students use a reflective blog to record their thoughts about and evidence of their learning. For student perspectives on this highlands trip, take special note of Prerna Das’ entry and Nandini Hannak’s post. Kolb, D. Experiential learning: Experience as the source of learning and development. Englewood Cliffs, NJ: Prentice Hall. 1984. Print. Lockwood, Ian. “Amongst the Sacred and the Sublime in the Dry Zone.” Ian Lockwood Blog. February 2014. Web. Lockwood, Ian. “A Week Without Walls in Sinharaja.” Ian Lockwood Blog. February 2013. Web. Lockwood, Ian. “Explorations in Sri Lanka’s Dry Zone.” Ian Lockwood Blog. February 2014. Web. Lockwood, Ian. “ Getting to Know Sri Lanka Intimately.” Sunday Times (Education Times). February 2015. Print & Web. Myers, Norman et al. “Biodiversity hotspots for conservation priorities.” Nature. 24 February 2000. Print & Web. Sobel, David. Place-Based Education: Connecting Classrooms & Communities. Great Barrington: Orion Society, 2004. Print.